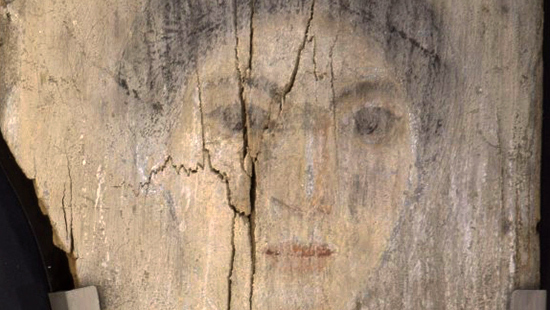 Our research team, headed by Marc Walton, investigated details of the materials and methods used by Roman-Egyptian artists to paint lifelike mummy portraits more than 2,000 years ago. The researchers identified the pigments used by the artists and the order the paints were applied and to which regions, as well as sources of materials and the style of brushstrokes used. The researchers uncovered unexpected use of Egyptian blue and traced several of the paintings to the same workshop and possibly to the same artist. In a parallel research effort, a joint engineering and biology research team from Northwestern investigated a portrait mummy of a five-year-old girl. 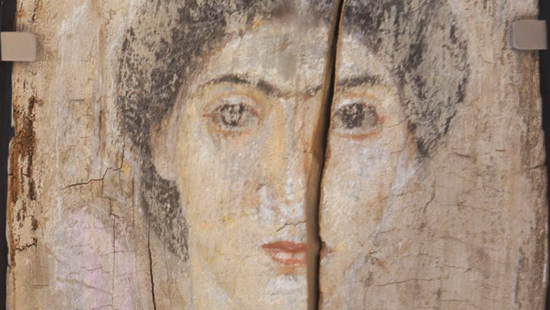 The mummy and the portraits, along with research findings, were on exhibit entitled "Paint the Eyes Softer: Mummy Portraits from Roman Egypt" at the Block Museum at Northwestern during January - April, 2018. 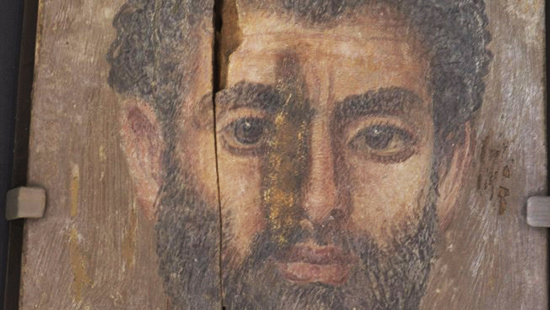 The researchers studied 11 mummy portraits and four panel painting fragments. 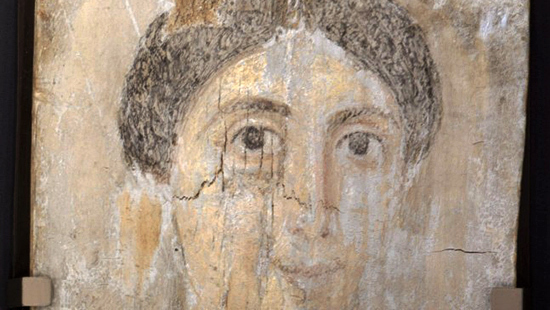 The 15 paintings were excavated between December 1899 and April 1900 at the site of Tebtunis (now Umm el-Breigat) in the Fayum region of Egypt. They now are housed in the collections of the Hearst Museum at the University of California, Berkeley. Research on these paintings contributes to the international collaborative study project Ancient Panel Paintings: Examination, Analysis and Research (APPEAR), initiated by the J. Paul Getty Museum. 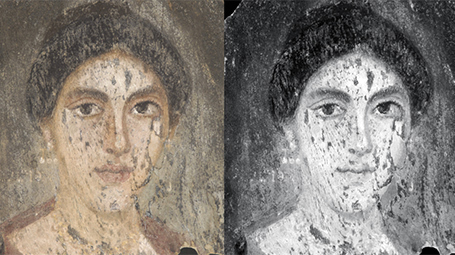 APPEAR aims to create an international digital database to compile historic, technical and scientific information on Roman Egyptian portraits. The researchers made use of advanced imaging and analytical tools in Northwestern University's NUANCE Center (Atomic and Nanoscale Characterization Experimental Center), including X-ray fluorescence and X-ray diffraction to uncover the surprising use of Egyptian blue in the mummy portraits. To learn about the cause of death, the diet and the method of mummy wrapping, the researchers ran a CT scan of the mummy. This was followed by a Advanced Photon Source synchrotron radiation analysis at the Department of Energy’s Argonne National Laboratory to reveal more mysteries. In the image above, the three portions compare RGB image (~450-750 nm) on the left, near infrared image (NIR, 750-1100 nm) in the middle, and NIR fluorescence (750-1100 nm) image on the right. This study was performed for each portrait in this study. The RGB and NIR images provide a general sense of the colorants used and how the portraits were painted. The fluorescence images mainly show the distribution of a single pigment- Egyptian Blue- which exhibits a strong luminescence at ~900nm when excited by visible light. All images were acquired using a Canon EOS 5D Mark III camera with the IR blocking filter removed. For the both the NIR and NIR fluorescence images, a visible-light blocking filter (750 nm) was placed in front of the lens. Illumination for the fluorescence images was achieved using a flash with a IR-UV blocking filter (visible pass) attached. The surface topography of these painted surfaces is composed of the sub millimeter brush and tool marks that reveal how these objects were made. We present this information as a surface normal vector map, calculated via photometric stereo (PS). A surface normal vector indicates the direction a surface is oriented. Here we conveniently store these data as an RGB image where the red, green, and blue channels are respectively the X, Y, and Z components of the vector. For this project, we developed a new PS algorithm that takes into account near lighting conditions and specular reflectances. We used our near-light model for the most accurate photometric stereo calculations of surface normals. More information about this work and how we captured these data can be found on the comp photo lab website. Walton, M., and A. Shortland. 2016. "Red-Shroud Mummies: Links and Sources." In Science in the Study of Ancient Egypt, edited by S. Zakrzewski, A. Shortland, and J. Rowland, 289-298. New York: Routledge. Ganio, Monica, Johanna Salvant, Jane Williams, Lynn Lee, Oliver Cossairt, and Marc Walton. “Investigating the use of Egyptian blue in Roman Egyptian portraits and panels from Tebtunis, Egypt.” Applied Physics A 121, no. 3 (2015): 813-821.